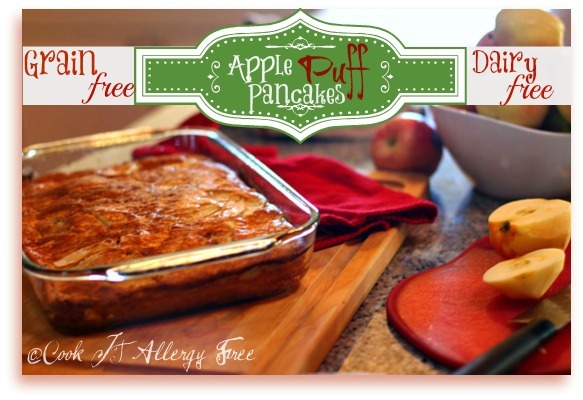 I was not originally going to blog about these Dairy-Free, Gluten-Free, Grain-Free Apple Puff Pancakes….mainly because it calls for 6 eggs and I have never been able to successfully convert a recipe to an egg-free version when it calls for anymore than 3 eggs. And also because, I made these at 6 am and had no good lighting in my kitchen for photos. And because I am Cook It Allergy Free, and because, like my tagline says, I specialize in Customizing Recipes to Work With Your Food Allergies, I rarely post a recipe that can not be converted to be allergen-friendly for most of the common allergens. But…with that being said, my family still declared that I needed to post this one. So, if you need to be egg-free, I apologize that this recipe cannot be converted to be allergen free for you. Blame this on my boys…all three of them. Just skip this recipe (or send it on to a friend who does eat eggs). I promise I will be back soon with an apple recipe that takes NO eggs at all and will be perfect just for you, my wonderful egg-free readers. I will also add here that to make this recipe grain-free, I use Almond Flour as part of the blend (mixed with a tablespoon of Coconut Flour). This, however, can be easily converted to be Nut-Free by using an all-purpose gluten free flour blend. I have done that with this recipe many times and it turns out perfectly as well. I note the directions to do this in the recipe. I am really into apples these days for a few reasons. One, because it is, of course, fall. Two, because I just received a hearty helping of them in my latest Bountiful Baskets delivery . And three, because of their numerous health properties. The apples, along with the vital nutrients gained from the eggs (especially from pastured eggs), and from the almond flour, helps you to feel good about feeding this to your family before you send them off for a productive day. And for even more Health Benefits of Apples check out this list of 10 Reasons To Eat An Apple A Day over at Mother Nature Network! 2. In high speed blender, blend the eggs at high speed for 1 minute. Next add: Coconut Milk, Almond Flour (or Gluten-Free Flour Blend), Coconut Flour, Coconut Sugar, Vanilla, Cinnamon, and Sea Salt. Blend on high speed for 1-2 minutes. 3. Remove baking dish from oven and pour batter evenly over apple mixture. Place back in middle rack of oven and bake for 20 minutes, or until pancake is puffed and brown. 4. Serve immediately. Note that the pancake will start to fall as it begins to cool. This is normal and what it is supposed to do. Thank goodness I can eat eggs, I’d hate to miss out on this recipe – sounds like the perfect morning comfort meal! when I read ‘pancake’ I thought – it’s the strangest looking pancake I have ever seen! I’m sure this recipe will make you the most popular kid on the block today! I love puff pancakes (call mine a Volcano Pancake LOL) and this one looks fab. Honey, your photos even on a bad day are stellar! 🙂 I bet someone will take this concept and make it egg free, too. Thanks for sharing, and love the apple bennies. I love my apples! LOL! Oooh! I would love to be the most popular kid on the block today! I love the idea of the Volcano pancakes, SHirley. It is true. THey totally puff up and it is so fun to watch them. The only bad part is that they start falling as soon as they cool down! Hmmm…if anyone does attempt these as egg-free I will be anxious to hear what they did and how they did it! I love apples! Whenever my stomach feels fudged up, I eat an apple and it always makes me feel better. You are rocking my world with that Apple puff pancake , Kim!! LOL, Melanie!! I love rocking people’s worlds!! 😉 These are just a really quick and easy way to have a healthy breakfast in the morning! Oh Lordy Pete Kim, that apple puff pancake looks AWESOME!!! Thanks Em!! How are you doing?? How is the new job going? Miss you! These look amazing!! Could you substitute the coconut ingredients? Hi Lyndsay. Thanks so much! If you can do regular dairy, you can easily use regular milk for the coconut milk (or you can use almond milk or rice milk). For the Coconut Oil, you can use butter (or Earth Balance Vegan Butter). For the Coconut Sugar, just use brown sugar! Looks delish! For the coconut milk, do you mean the canned kind or the coconut milk beverage found in the dairy case like So Delicios? Thanks! And would this work with pears instead of apples? I thinks so, but want to double check. Apples are my all time favorite fruit! They are tasty and good for you! This looks delicious! Thanks Sarena! I buy apples in bulk around here, so there are always plenty on hand to play with…especially at this time of year! I’ve never had a puffed pancake! Sounds and looks delicious Kim! I love your apple tips. Apples are so tasty right now! Oh, I am printing this now. My boys eat eggs and they would love this. I will try pecan meal in place of almond flour and see how it works out. Thanks, Kim. Debbie, let me know how the pecan meal works in place of the almond flour! That sounds like it would be a delicious substitution! This looks like such a fabulous fall breakfast! Great recipe and my husband is an apple freak – I am going to not tell him about all the health benefits least he change his mind! Made and am loving it! Mine had to cook about 40 minutes here in Denver. I’m making these for dinner! No dessert! No both!!!! OOH…..I cant wait for the egg free recepies. Hi Kim – I made this with what was on hand and it turned out great! I used a little less coconut oil (6 TB), an extra apple (because they were small, next time, I’d use 4 apples), sweetened vanilla almond milk in place of the cocnut milk, regular sugar on the apples (but only about 1 and 1/2 TB), I used a gluten-free pancake mix in place of the flours and omitted the vanilla and sugar (because of the particular almond milk I used) and they still managed to turn out great – thanks! Hi Rachelle! I am so glad that you enjoyed the puff pancake! 😉 It is one of our super easy favorites around here as well! I love your substitutions in it, too! I often make it with my flour blend instead of the almond flour and it is just as good that way as well! Happy holiday! Yummy! Thanks so much! I halved the recipe and made a few other changes. I just made this using blueberries instead of apples, honey instead of coconut sugar (1T in bottom of pan and 2T in mix), 1/2 cup of almond milk, used half of all other iingredients in a 81/2 X 11 pan. Because of the honey I baked it ar 420 though 415 might be better. It was done in about 17 min. This was so delicious! 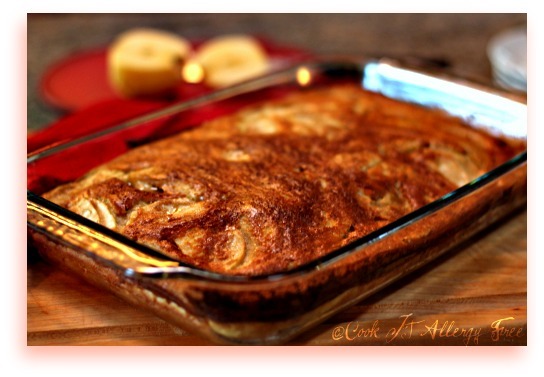 It reminds me of a similar apple casserole pancake (with gluten) that my grandpa used to make and that I loved! Thanks so much, Barbara! I hope you enjoy them!! 😀 Let me know what you think of them! Was so looking forward to this… I make a Peach Puff Pancake once each year when the peaches are ripe. Unfortunately, this year I no longer eat grains, and was excited to see this recipe. While mixing it up, I missed the almond flour and now I am afraid we will be eating soup! Read it in the comments, and looked back up and yes, there was almond flour. So disappointed!! I may try again but usually only eat this once a year. Maybe next year…. Thanks for the recipe and I am sure it is delicious when made correctly! Thanks so much for reporting back on your results! Hi Barb, thank you so much for sharing that. This makes me think completely differently about coconut sugar now. I did not realize the extent of what it does to coconut production. This is a very interesting article from TT. I appreciate you sending me the link. I made these with Ener-G egg replacer in a shorter glass pan and cooked for 40 mins! It stayed moist because probably I didn’t use real eggs. It came out like a dessert…I used Stevia as I don’t have coconut sugar. I used unsweetened almond milk. Very yummy! So when I used the EnerG egg replacer….it took 40 mins. to bake and it stuck to the bottom of the pan, but it was messy and absolutely delicious as a sweet treat (ie. dessert!) Yum. It didn’t produce a lot, 3 servings, so I will just make it for myself as it doesn’t come out of the pan cleanly when using egg replacer!!! Hi. Does anyone know if this can be put together at night and baked in the morning? Thanks!